if you live in Flanders of course :-). The french-speaking people will be attending 'Panique au Village' in the different cinemas in Wallonia and Brussels. 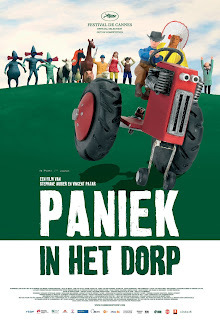 Paniek in het Dorp will be screened in Brussels (Kinepolis), Antwerp (Metropolis, UGC, Cartoons), Ghent (Sphinx), Leuven (Studio), Brugge (Lumière) and Hasselt (Kinepolis). Please check the official 'Paniek in het Dorp' website for more news, background information and other paniekstuff. Hope you guys have the same fun watching it as we did making it!